In order to maintain competition, manufacturers often have completely different laptop heads so that competitors’ products wouldn’t fit with them. This also encourages brand loyalty: imagine if you owned a Toshiba laptop, for example, and you decided you wanted a new one – while it wouldn’t be the deciding factor, it’s useful to know that your old charger (if it’s still working) could work with a new computer – this is quite likely if you end up buying the same brand. The silver lining is that there is some standardisation coming into play now – especially in the mobile market, where a possible universal charger in Europe by 2015 means that some stores are even moving towards selling phones without chargers. Acquisitions in the computer industry have also meant that some brands, such as the Compaq-HP tie-up, mean that laptop chargers are compatible across multiple brands. Sadly though, these are currently few and far between. Even if you were to use the same brand, some specialist laptops still need separate power supplies. Apple is a prime example of this, switching up MagSafe heads to allow for more power in newer models and so forth. PC gaming rigs such as Alienware and XMG laptops require additional power (usually in the form of a 120W laptop power supply, which we’re pleased to say that we do cover) so may not be compatible even with chargers owned under the same brand/company (Alienware is a subsidiary of Dell). This is why it’s critical to know your laptop make/model when choosing the right laptop tip. 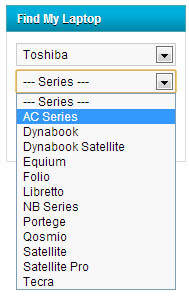 To get around the problem of figuring out what you need, some websites have set up a system where you can search for your laptop through a series of drop-down menus like the one seen below. While this means you might be able to eventually get an exact match for your laptop, it also means that sometimes your laptop model isn’t in the list, or that it takes a very long time to isolate your exact model. Imperial Gadgets operates a different approach – we don’t see why you should go through the hassle. We ask our customers to take a quick look at the sticker underneath their laptop, type in relevant details to us (model number, voltage and current) and we’ll make sure the right head gets picked for your laptop! Choosing the right laptop tip has never been so easy. Alternatively of course, if you’ve already done your research you’re more than welcome simply to purchase a charger straight-up and it will arrive with the eight most prevalent tips. They fit a wide variety of laptops and about 60% of our customers do not need an extra tip. We hope this has been useful, and that this has helped make sure you don’t accidentally get a tip other than the one you needed! Feel free to get in touch with us at any time if you need help and we’ll make sure that you get the tip that’s right for you.